A question I tend to get a lot is how do I keep Greer from touching all of my decorative accents. If you've seen my home, you know that I like to keep it decorated for the seasons and holidays. There are décor pieces all around, from the bottom of the console table to the hearth by the fireplace. Most of these (glass, sentimental, delicate, and/or special pieces) are in perfect reach of an adventurous and curious toddler. So how do I do it? Let me start by saying, I've always known I wanted a family-friendly + styled home that was cozy and welcoming. I knew I needed to keep my expectations reasonable and maintain flexibility, but without compromising my style. Because dear friends, you can have a beautiful home that reflects your personal taste even if you're house is full of little ones. It is possible, and I encourage you to try! Discipline on behalf of myself + husband, and Greer too. Since a very early age, we have set rules and boundaries in our home for our daughter. We do this not only for her safety, but for her enjoyment too. As her parents we have to stay consistent with enforcing the rules. and following through when she does not listen. And by choosing to listen, Greer's discipline for not touching/doing what she shouldn't becomes a habit for her. With clear guidelines, she can freely enjoy her home while being respectful of the things around her. Don't fret, we aren't perfect at this, and Greer doesn't also listen the first time. It's not perfect, but I can tell you that 9 times out of 10 our girl is following the rules and that's because we're consistent in our home and in others'. We implemented this as soon as she started reaching out and grabbing for things. While we want her to explore, we also want her to do so safely. So if she reaches for something glass, dangerous, or just something we don't want her to touch, we use a stern and loving voice to tell her, "no touch." Greer trusts our word, and to this day when she's walking around playing, she'll occasionally point something out, and in the sweetest little voice say, "no touch!" Then she moves on her merry way. Setting things out that are decorative and okay for playing. I don't want to taunt Greer with our décor. So I make sure to include pieces around the house that are play-friendly. Items that she is welcome to play with as she pleases and to return at the end of day before bedtime. For instance, I have two plastic pumpkins just her size sitting in the magazine rack. There is also a plush, pillow pumpkin in the basket next to her chair. And she has a little pumpkin basket to play with and keep toys in during the fall season. She loves having her own décor just like mama's, and I love making it available to her. Keeping a designated play space just for her. On the other half of our family room, is Greer's play area. It's where we keep her toys, and we have tried to make it a special spot (decorated too!) where she can do all the toddler things. She knows where her toys go, how to treat them well, and that she can play with them all over the family room while being mindful (and careful) of what is around her. Helping her see tangible boundaries throughout our home has been huge in helping her understand boundaries that aren't so visible. So there it is! These are a handful of the ways I maintain a decorated house year round with a little running around. Her wonder at the festive touches delights my heart. Her favorite things are the "twinkle lights" strung around the grapevine pumpkins, and she loves the garland strung from the mantle too. She has the sweetest demeanor, and after nap last week, when I had finished photographing the house for the Fall Home Tour, she came into the family room leaned on the ottoman and took it all in (I secretly captured her in the photo above). I heard her say, "Wow!" before turning around to me with the biggest grin on her little face. It was more magical than the décor itself. And it was the best reminder of one of the biggest reasons why I decorate, for the delight of my family. Friends, I hope you were encouraged by this. By no means is our house always in a state of perfection. There are nights when the toys aren't put away (and mama is too tired to even bother); days when listening isn't Greer's strong suit; and weeks when the laundry basket becomes part of the décor. 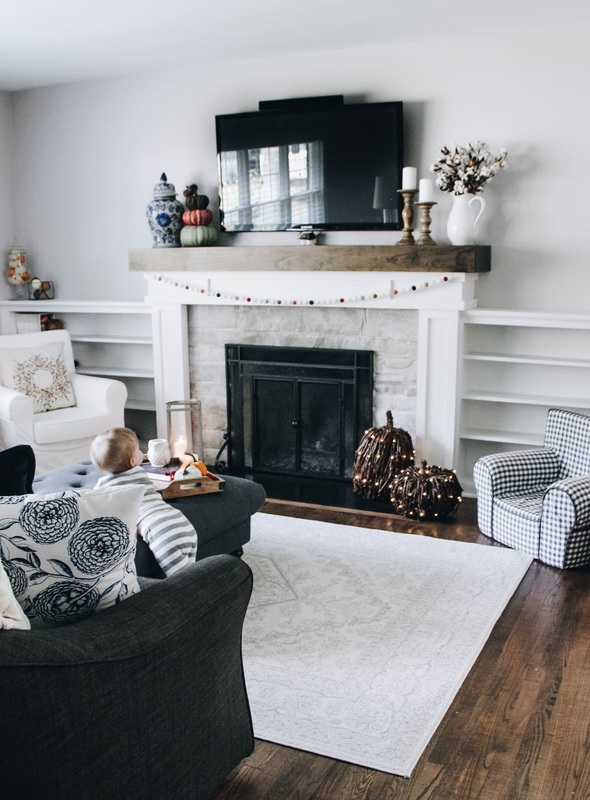 But, perseverance is everything and implementing some of these tips will have you well on your way to a decorated home full of littles. Happy decorating!